In the current season, the Pitmen played Oleksandriya three times. In two league games, Mircea Lucescu’s side won 2-0 and 3-2. In the first Cup semi-final, they were tied 1-1. This is much more important now. After the match in Oleksandriya, Mircea Lucescu pointed out: the hosts tried to impose challenges upon Shakhtar. The opponents frequently fouled, defending in a quite organised way. Largely due to this, they managed to concede just one goal. It is likely that in the second leg, Oleksandriya will operate in about the same manner. At the same time, they definitely need to charge forward and score. Oleksandriya have achieved their goal in the league: the team will finish the season in the 6th spot, which gives them the right to play in the Europa League. The charges of Volodymyr Sharan will start from the third qualifying round. However, if they manage to make it past Shakhtar and win the Ukrainian Cup final, they will make it directly into the European club cup group stage. So Oleksandriya’s motivation for the Cup semi-final may even be triple rather than double. Due to suspension, Artem Polyarus and Anton Shendryk will miss the return game against Shakhtar. At the same time, Artem Chornyi, who didn’t appear in the semi-final first leg for the same reason, will be back. Teams have played three games in the Ukrainian Cup. On all occasions, the Pitmen played as visitors. The Orange-Blacks have two wins and one draw. The goal difference is 6-2. The teams played in Oleksandriya on April 20. Early in the match, Shakhtar approached the opposition goal a few times, with the hosts withstanding it. On 36 minutes, the charges of Volodymyr Sharan took the lead: Hrytsuk managed a beautiful and accurate long ranger. At half-time, Eduardo came on. He equalised on 54 minutes sending home a deflected ball. 1-1 – an away draw with Shakhtar having an away goal in the first game. Shakhtar may well reach the Ukrainian Cup final for the 16th time (including the 6th consecutive season). 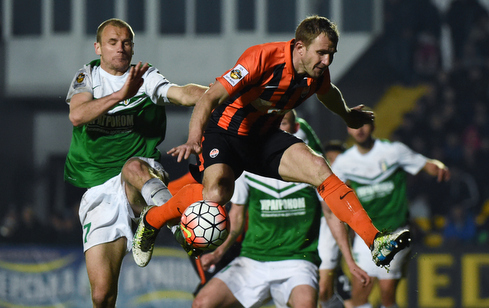 Shakhtar boast 18 goals in the current Ukrainian Cup campaign.